The Conrad Prebys Aztec Student Union, or Union for short, is your home away from home and the community center for the campus. It was made possible by former SDSU students who voted to build an all new LEED Double Platinum student union. The Union is entirely student-fee funded and receives no State funding. Browse our web site to learn more about the services and amenities available. 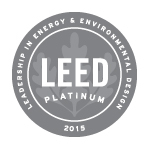 We are proud to announce that we have received our official LEED DOUBLE PLATINUM CERTIFICATION!